In the year 1970 Otto Mühl founded a commune in his Vienna apartment, which became famous beyond the artistic scene for its radical nature. In 1972 the communards obtained the last inhabitable building in an abandoned farm on the Parndorfer Heide: Friedrichshof. This became the centre of an international network of more than 20 urban groups over almost 2 decades. The inhabitants of the associated communes covering half of Europe, numbering over 600 people at times, practised a radical, utopian lifestyle according to the principles of "self-expression, communal property, free sexuality without permanent couple relationships, joint labour and production, collective upbringing of children and direct democracy". By the end of the 1980s, when Mühl was facing a criminal investigation and many members of the communes were gripped by increased discontent, the joint property was placed in the hands of a cooperative, and in 1990 the social living experiment was formally dissolved. In autumn 1991 Otto Mühl was convicted of sexual abuse of minors and imprisoned. It is important to the former communards, who are today organised in a cooperative, that it should be possible for individuals to come to terms with the experience of life at Friedrichshof. 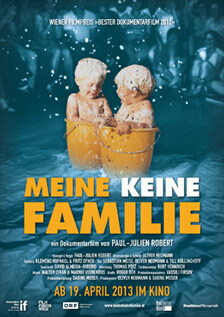 Consequently, they released archive material for the first time so it could be used in the film „MY FATHERS, MY MOTHER & ME“.